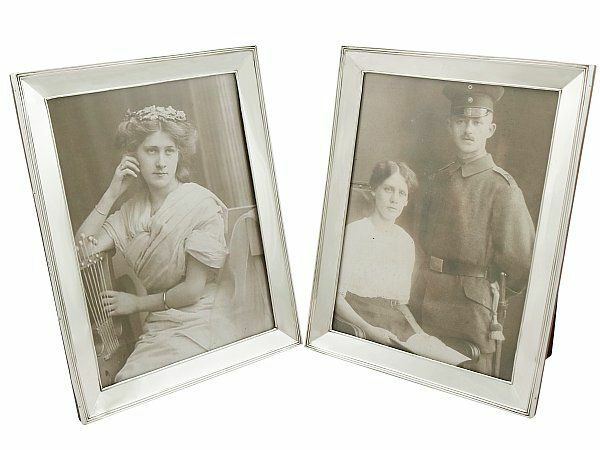 These fine antique George V English sterling silver photograph frames have a plain rectangular form. The plain chamfered surfaces of each sterling silver photo frame is embellished with a reed decorated border to the rim. Each silver photo frame is fitted with an oak wood back and hinged strut, secured with two swivel catches; the versatile strut facilitates the frame to be situated in either a portrait or landscape stance. Read a brief history of antique photo frames. These antique frames are a very good gauge of silver, excellent quality and in excellent condition in keeping with age and type. The reed decorated borders are sharp. Full hallmarks struck to the surface of the rim of each frame are all very clear. Reflections in photographs may detract from the true representation of these silver photo frames 8 x 10.